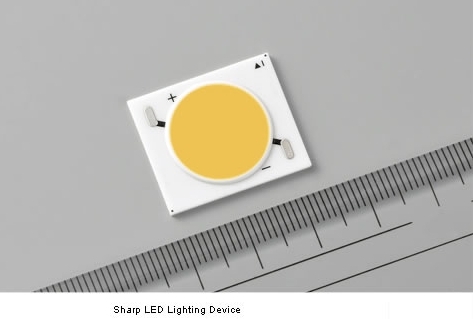 Sharp Corporation has developed and will introduce a high-power LED lighting device that features the industry’s highest luminous efficacy of 93.3 lm/W (lumens/watt) in the 50W input power class as a light source for applications such as downlighting in retail stores. LED lighting is rapidly increasing in popularity based on its superior characteristics such as long service life and low energy consumption. In the future, lighting sources for applications such as downlighting and spotlights in retail stores are expected to shift to higher-power LEDs. This newly developed device, the GW5DME30MR5, incorporates an LED chip with high emission efficiency combined with a proprietary blend of phosphors. As a result, it achieves a luminous efficacy of 93.3 lm/W, the industry's highest in the 50W input power class, at the 3000K color temperature commonly used in downlights for retail stores and with a color rendering index (Ra) of 83. It achieves high energy-saving performance. In addition, proprietary package technology provides for greater color consistency, contributing to higher quality in the design and development of lighting fixtures. The lineup also includes high-performance models that feature a color rendering index (Ra) of greater than 90 to meet the need for light sources which require higher color rendering properties. 2. Proprietary package technology provides for greater color consistency.